L-R: Mr Oumarou Issoufou, Director General, Niger Republic Shippers’ Council, Mr. Haruna Baba Jauro, Ag. 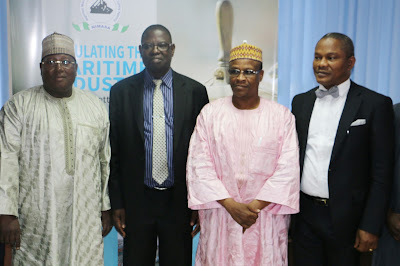 Director General, Nigerian Maritime Administration and Safety Agency (NIMASA), Mr Solomon Ishaya a Director at the Federal Ministry of Transport, and Barrister Calistus Nwabueze Obi, Executive Director, Maritime Labour and Cabotage Services, NIMASA, when the Nigerian/Nigerien Joint Commission on Transit Cargo paid a courtesy visit to the Agency in Lagos recently. Mr Haruna Baba Jauro, the Acting Director General of the Nigerian Maritime Administration and Safety Agency (NIMASA) has restated the agency's commitment to ensure facilitation of a hitch-free transit cargo to the Republic of Niger through Nigeria’s sea ports. This is contained in statement by the Head of Public Relations of NIMASA, Hajia Lami Tumaka, made available to newsmen in Lagos. The statement said Jauro gave the assurance when the Nigerian/Nigerien Joint Commission on Transit Cargo led by the Director General of the Shippers’ Council of the Republic of Niger, Mr Oumarou Issoufou, paid a courtesy visit to the agency recently in Lagos. He noted that Nigeria and Niger could work together without barriers to ensure smooth passage of goods between both countries. The NIMASA boss also expressed satisfaction with the activities of the Commission, specifically in the area of trade relations between Nigeria and Niger. He said both countries had a lot to benefit from each other on issues concerning trade. “We will continue to share ideas on how to make the relationship better and remove all barriers to successful transit of cargo between the two countries using global best practices”, Jauro said. Earlier in his address, the Director General of Niger Republic Shippers’ Council, who spoke through an interpreter, commended the Agency’s efforts in ensuring safety and security in the nation’s ports. He also pledged the readiness of Niger Republic to co-operate with the Nigerian government for the interest of both countries. “We have been to the Apapa and Tincan Ports and we observed the quality of safety and security available on the Nigerian waterways, which are commendable”, Issoufou stated. He further appealed to the agency to do its best to foster a good relationship between both countries. The delegation from the Republic of Niger comprising mostly economic operators was in Nigeria to inspect port facilities ‎with a view to channeling most of their cargo through Nigerian ports.